A lake is a reflection of its watershed . Precipitation on the land that does not infiltrate the soil or collect in pools flows downhill, collecting in streams and rivers, which may in turn flow into lakes or reservoirs farther downstream. In this way, the nature of the landscape—topography, soils, geology, and vegetation covering—influences the kinds of materials carried by surface-water runoff. When humans disturb the natural, protective vegetative cover of the landscape with homes, roads, farms, or other features, the types and amounts of materials dissolved or carried by runoff change significantly. For example, water draining urban areas typically contains metals such as lead and zinc, lawn fertilizers and pesticides, bacteria from pets, and automotive pollutants from parking lots and roads. Likewise, runoff from agricultural fields often contains nutrients, pesticides , and, if livestock are present, bacteria. Contaminants originating from such diffuse sources are called nonpoint-source pollutants. Some wastes enter water from a pipe or other defined location called a point source; hence, the waste is called a point-source pollutant. Factories and wastewater treatment facilities, for example, produce wastes containing nutrients, metals, pesticides, and other chemicals that, when discharged into water, can pollute downstream lakes. Human wastes are the primary contributor to eutrophication, the most pervasive of water quality problems in lakes. Humans also are directly responsible for two additional stresses on lakes: overuse and exotic (or invasive) species. Eutrophication is best defined as the excessive addition of inorganic nutrients, organic matter, and silt to lakes that causes a corresponding increase in biological productivity. 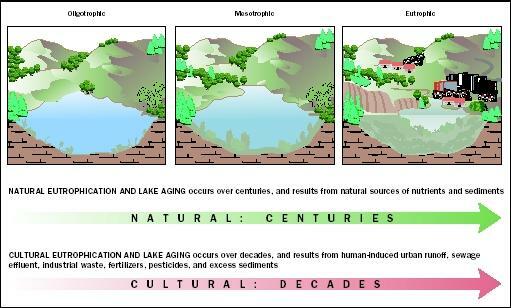 High concentrations of nutrients alone do not make a lake eutrophic—there must be a biological response as well. Nutrient concentrations, however, may be used as indicators for the potential of eutrophication. For example, phosphorus concentrations exceeding 30 micrograms per liter are sufficient to cause excessive algal growth in some lakes, and therefore eutrophication. The natural process by which lakes form, "age," and ultimately fill in to form dry land takes centuries, or even thousands of years. Human activities can change these lakes in less than a single generation, via a process known as cultural eutrophication. becomes too shallow for safe boat operation. In addition, motorboats, particularly personal watercraft, operating in shallow water stir up bottom sediments with their wakes. This resuspends sediments, increasing turbidity and releasing nutrients back into the water. Eutrophication can be greatly accelerated by human activities. Some lakes naturally remain unproductive for many years. For example, Lago di Monterosi, an Italian lake, was unproductive (oligotrophic) for 22,000 years until the Romans cut trees within its watershed to build a road known as the Via Cassia. The lake became eutrophic for the next 500 years until the natural balance in the watershed was restored. With no further human disturbances, Lago di Monterosi returned to an oligotrophic state. The increased rate of eutrophication caused by human activities is called cultural eutrophication. 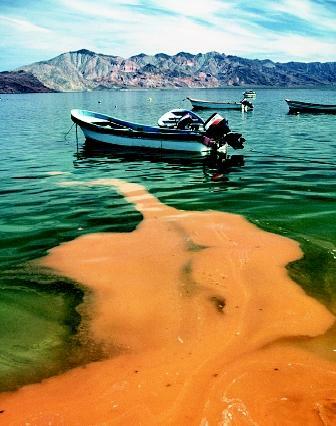 Cultural eutrophication is the primary cause of lake degradation worldwide. It occurs rapidly (relative to most natural and geological processes) and can be difficult, if not impossible, to reverse. In the United States, a significant amount of money has been spent since the 1970s to reduce pollutants from the many varieties of point sources, and hence to reduce the rate of cultural eutrophication caused by nutrient discharges. More recently, efforts have focused on managing and reducing nonpoint-source pollutants. Controlling nonpoint sources of pollution remains the primary objective of U.S. lake management today. For example, new stormwater management regulations have been included in the federal Clean Water Act: as a result, communities must now manage and treat stormwater runoff. A variety of federal and state programs provide assistance to farmers to install best management practices. Best management practices also have been developed for timber harvesting and home construction. The purpose of these programs is to keep nutrients, soil, and other materials on the land, rather than allowing them to enter the water uncontrolled. Despite such programs, lake quality remains a concern. In the 1998 National Water Quality Report to Congress, the U.S. Environmental Protection Agency reported that 45 percent of the lakes and reservoirs assessed by the States and Indian tribes were impaired. Nutrients, metals, and sediments were the top three pollutants causing impairment. Top sources of pollutants included agriculture, urban runoff and storm sewers, and municipal point sources. The demand to live and recreate on water has never been higher. The number of U.S. boats registered increases each year, as does the average size of boat engines. Industry sources estimate that there are more than 11 million recreational boats in the United States. While aquatic recreational demands increase, the amount of the resource stays the same—reservoirs and large lakes rarely are constructed any more. Hence, crowding and conflicts over lake uses are now common. In a recent survey of people recreating on a large Indiana reservoir, people responded that overcrowding and unsafe boaters were the biggest problems affecting their enjoyment of the water—not traditional water quality concerns such as algae or poor transparency. An important step in the lake management process is to identify the primary use of a particular lake and then manage for that use. Many lakes simply cannot support all the uses people wish for them. For example, because meso-eutrophic lakes (those between a mesotrophic and eutrophic condition) generally support the highest sport fish populations, a good fishing lake will have slightly green water with abundant rooted plants. Lake residents who demand clear water and abundant fish cannot have it both ways. Likewise, motorboats should not be permitted in lakes, or in lake areas, where the primary use is swimming or aesthetic enjoyment. Useful techniques to manage recreational overuse include time zoning and space zoning. In time zoning, some uses are restricted to certain times of the day. For example, to allow residents or anglers peace and quiet at dawn and dusk, water skiing might be limited to the hours of 10 A.M. to 5 P.M. With space zoning, different areas of the lake are designated for particular uses, such as swimming, idle speed zones for motorboats, or protected fish and wildlife refuges. Like many waterbodies in other countries, U.S. waters are being assaulted by a variety of invasive and exotic species. Termed aquatic nuisance species (ANS), such species often are better competitors and often drive out native species. This upsets food webs as native predators may not adapt to consuming the new species. Heavy recreational use of lakes and reservoirs increases the chance of petroleum spills, sewage discharges, and releases of invasive species from watercraft. Integrated lake management is needed to protect water quality and to balance human and ecosystem needs. Aquatic ANS include algae, plants, fish, and invertebrates. Most of the introductions are accidental. Zebra mussels and other invertebrate invasives such as the spiny water flea are thought to have invaded the United States via ballast water of ocean-going ships. In Florida, the state with the widest variety of invasive species, many ANS escaped from aquariums or decorative ponds. More than three-quarters of the ANS plant species affecting northeastern states escaped from cultivation—decorative ponds and plant nurseries—where they had been imported for sale. Many invasive plants, such as the now-ubiquitous Eurasian watermilfoil, spread by attaching to boat motors and trailers—to be then introduced to the next waterbody the boat enters. Major efforts to combat ANS include education programs aimed at boaters, consumers, and children. Several states, including Washington, Maine, and Wisconsin, have passed legislation making it a crime to transport ANS on boats or trailers. Minnesota has had an effective ongoing education program since the 1990s, and other states have similar outreach efforts. In a recent survey, 91 percent of Minnesota boaters thought it was important to prevent the spread of invasive plants on boats and trailers. ANS education programs aimed at school children will educate the next generation of lake users about the dangers of invasive and exotic species. Lake management must begin in the watershed, or drainage basin. The watershed sources of lake pollution must be solved before the in-lake problems are addressed. Consider this medical analogy—aspirin may treat the body ache symptom of a bacterial infection but antibiotics are necessary to treat the cause. Likewise, treating lake algae with herbicides only treats the symptom. The cause of the problem are nutrients originally from the watershed. There are many in-lake techniques that can be implemented to speed up lake recovery once the watershed sources of the problems are managed. Dredging can remove accumulations of sediments and their associated nutrients. Aluminum sulfate (alum) treatment forms precipitate that "strips" phosphorus from the water column and forms a barrier on the sediments to prevent phosphorus release from the sediments. There are a variety of aeration techniques that work to improve low oxygen concentrations in hypolimnetic (lower) waters. Fish can be stocked in the lake to create a more balanced fishery. These and other in-lake techniques can be an important part of a comprehensive lake management plan. SEE ALSO Clean Water Act ; Erosion and Sedimentation ; Fisheries, Fresh-Water ; Forest Hydrology ; Great Lakes ; Instream Water Issues ; Lake Health, Assessing ; Nutrients in Lakes and Streams ; Pollution by Invasive Species ; Pollution of Lakes and Streams ; Pollution Sources: Point and Nonpoint ; Recreation ; Reservoirs, Multipurpose ; Runoff, Factors Affecting ; Uses of Water ; Wastewater Treatment and Management ; Watershed, Water Quality in a .
Holdren, G. Chris, William W. Jones, and Judy Taggart, eds. Managing Lakes and Reservoirs. Madison, WI: North American Lake Management Society and Terrene Institute, in cooperation with the U.S. Environmental Protection Agency, 2001. Cooke, G. Dennis et al. Restoration and Management of Lakes and Reservoirs, 2nd ed. Boca Raton, FL: Lewis Publishers, 1993. Phillips, Nancy et al. The Lake Pocket Book. Alexandria, VA: Terrene Institute, 2000. North American Lake Management Society. <http://www.nalms.org> . Wisconsin Lakes Partnership: UW Extension, Lakes Program. <http://www.uwsp.edu/cnr/uwexlakes/default.asp> . Water. U.S. Environmental Protection Agency. <http://www.epa.gov/ebtpages/water.html> . * See the "Pollution by Invasive Species" entry for photographs of the snakehead fish and other aquatic invaders.